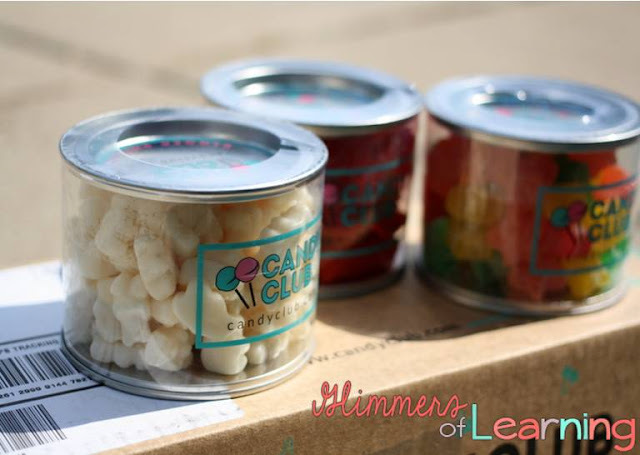 I am so excited to have come across this awesome website, The Candy Club! They deliver a box of candy to your doorstep either: monthly, for six months, an entire year, or as a onetime deal. I LOVE candy so I could not wait to get my box and open it! I was a little worried it would be your run of the mill candy that you could buy at the grocery store but I was so wrong!!! In each box you receive three canisters full of different types of candy and they always sprinkle something fun (candy wise) on top! Before you order your box you will take a quick four question quiz asking some of your preference toward: sour, sweet, sugar, etc. This will help them determine what box is best for you! There are three different types of boxes to choose from. It will show you what box they recommend you try but they also give you an option to pick a different type. The three types are: Club Mix (sweet and sour candy), Club Sweet and Club Sour. In each box you will receive a description of the items and on the back you will also get the nutrition facts. Albanese White Strawberry-Banana Gummi Bears: I was VERY skeptical about these but I LOVE THEM! I could eat the whole contain in one sitting! They are literally next to me as I am writing this! I need to put them away or they'll be gone tomorrow! - Sweet's Sours Stars: Five flavors of assorted sweet but sour candy! - Lucky Country Strawberry Licorice: DELICIOUS! I honestly LOVED everything I got! This would be a great birthday present for someone or a great thing to send to a friend or child who is away at college! I don't know about you but I always struggle to think of things to buy kids for their birthday or Christmas, especially around the tween years, and this is PERFECT!! If you aren't sure of their preference I would choose the Club Mix as you get a little of each! all you need to do is Clickhere! You will see an offer to try it for $15 off but this is actually a better deal as you don't have to pay for shipping! Try it out, you won't be sorry! I can't wait for my next month supply of candy!